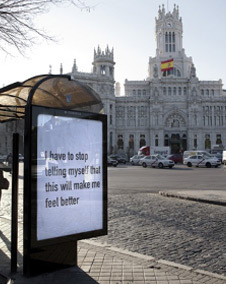 MaSAT (Madrid Street Advertising Takeover) is the second international street ad takeover project, and the third in a series of civil disobedience projects intent on changing our expectations of public behavior in our shared environments. For this SAT project we targeted Cemusa bus shelters in 4 heavily populated locations around Madrid. This time, at the request of our Madrid based collaborators, participants were asked to submit only text based works. This fantastic idea allowed us to open up the submission request process to a wide range of individuals including sociologist, teachers, lawyers, gallery owners and anyone with a concern for the curation and participation in public space. 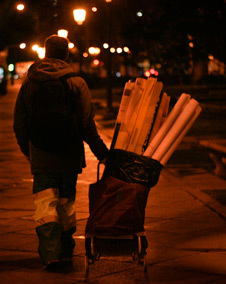 Each of the 106 individuals were asked to submit one sentiment they wished to see exhibited on the streets. The result is a variety of unique visions of public dialogue and a glimpse at the possibilities available when we open up our public environment in a truly public way. While I was personally worried about working in a country where I do not speak the language (well), the incredible efforts of the Madrid based organizers, NEKO and A. De Pedro, made the entire process possible and far exceed my expectations. A special thanks to C100, Nuria, Jaime Alekos, Dos Jotas, Luzinterruptus, Sue, Rosh, Clara Urra, 3ttman, Emile, Falansh and Giovana Ordonez Pari.